An attractive 1724 map of the Eastern Hemisphere by the well-regarded French cartographer Guillaume Delisle. 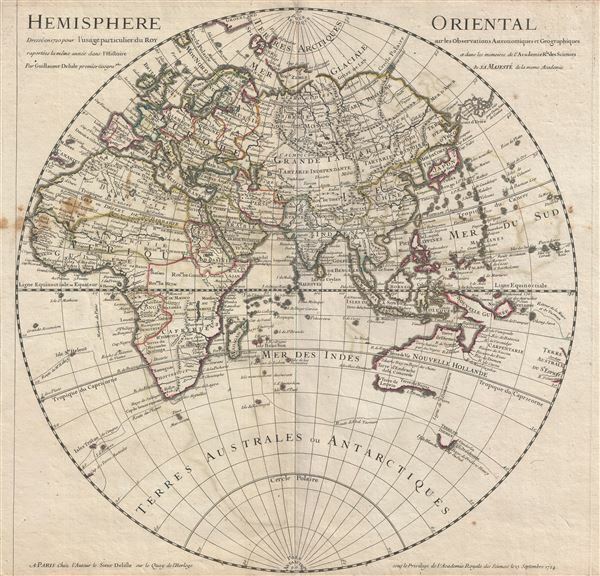 The map covers the Eastern Hemisphere from Pole to Pole and, along the Equator, from Western Africa to Eastern Australia, including all of Africa, Europe and Asia, as well as what little was known of Australia. Though rife with speculation, Delisle attempts to present a grand overview of the known world based upon the best reconnaissance available in the early 18th century. Northeastern Asia, the interior of Africa, the Arctic, Antarctic, and Antipodes were, for all intent and purposes, unexplored. The routes of well-known explorers, including Halley and Abel Tasman, are noted. By the early 17th century most of the coasts of Europe, Africa, and South Asia were well known, as reflected in this map. The map comes to life in those lesser known regions, including Australia, the interior of Africa, and the lands to the north and east of Japan. Our overview of this map will therefore begin in Australia, which had just begun to take concrete form following the explorations of Abel Tasman and others. The map clearly illustrates the western coasts of Australia, here identified as Nouvelle Hollande, though it leaves the eastern shores undefined. Delisle suggest a possible connection with New Guinea, through does not go so far as to unite the two landmasses. Van Diemen's Land or Tasmania appears to the southeast of the mainland of New Holland, but at this point in history only its southern shores had been mapped, and those only tenuously. It remained unclear that Tasmania was an island until the late 17th century navigations of Captain James Cook. Far to the east, at the border of the map itself, is another landmass labeled Terre Australe du S'Espirit, with several rivers but no western shore. Terre Australe du S'Espirit, in fact the New Hebrides, was mis-mapped by the near insane and zealously Catholic 17th century Portuguese navigator Pedro Fernandes de Queiros, who proclaimed that he had discovered the long speculated Great Southern Continent, or Terre Australis. Not to be confused with modern day Australia, Terre Australis was a vast theoretical continent that supposedly covered much of the southern hemisphere in Aristotelian symmetry with the bulk of Asia in the Northern Hemisphere. Another area of exceptional interest and great speculation are the islands to the north of Japan, here identified as 'Terre de Yeco,' 'Terre de la Compagnie,' and 'Terre vue par Dom Jean de Gama.' 'Yeco' or 'Jesso' is a name usually associated with Hokkaido (which here is drawn as part of mainland Asia), this land mass is often mapped either as or together with Gama or Gamaland and Compagnie. Jean de Gama is a mysterious 17th century Spanish explorer who rumors claim discovered islands rich in gold and silver northeast of Japan - a kind of Asian El Dorado. The Dutch navigators Maerten de Vries and Cornelis Jansz Coen were among the first navigators to sail into this unknown region in search of Gama's islands. Both Gama and Compagnie as presented here reflect preliminary sightings of the Japanese Kuril Islands in 1643 by de Vries and Coen. Two other apocryphal islands, set to the east of Japan, also have some bearing on this legend and are named only 'Rica de Oro' and 'Rica de Plana' ('Rich in Gold' and 'Rich in Silver'). Delisle presumably realized that neither Gama nor Compagnie were Juan de Gama's mineral rich islands, but found the legend too compelling to give up altogether. The seas to the north of the Detroit d'Uriez, are identified as Mer D'Amur (often called Mer D'Amor) and represent pure unfounded speculation. The interior of Africa is also mostly speculative. Zones suggestive of actual cartographic knowledge are limited to North Africa, Egypt and Abyssinia, the western part of the Niger River Valley as far as Timbuktu, the Congo, and Gold Coast, and the region opposite Madagascar identified as Momomotapa. North of Monomotapa, a long lake, identified near the city of Maravi, bears a striking resemblance to Lake Malawi, and suggests some early knowledge of the great Rift Valley lakes, most likely drawn from indigenous accounts. In the Nile Valley itself Delisle has chosen to focus on the Blue Nile, with its known source at Lake Tana in Abyssinia (modern day Ethiopia), as the primary tributary of the Nile, rather than the White Nile, which he allows to taper ojf just south of Gondar. Delisle has fully abandoned the Montes del Luna and other speculations on the source of the Nile - a remarkably sophisticated decision that few other cartographers were bold enough to embrace. This map was published by Guillaume Delisle form his offices at Quay de l'Horloge, Paris. The first edition was drawn in 1720. The present example represents and updated and revised edition presented to and approved by the Acadamie Royale des Sciences on the 15th of September, 1724. It proved popular with this and subsequent editions being published and revised throughout the 17th century. Good. Original centerfold exhibits some wear. Lower and upper margins narrow, but intact. Platemark visible. Some discolorations left center extending into the margins. Rumsey 4764.003. East Asian Map Collection, Sea of Korea Collection, EAMC 163.